(hoping this is the right forum). newbie here, though with some experience in woodworking. But that’s a topic for another day. I’m repairing one of Grandpa’s coffee tables which he created winter 1973-75. These tables all have a variety of wood “veneers” in general about 1/8 thick. The pattern for this table is labeled “church window” though that may be his label. Some of the Amaranth and some birdseye maple veneer / inlaid wood pieces have warped, pulling away from the 5/8 plywood substrate. He apparently used double stick tape to affix the veneer. See attached photo. I’ve succeeded in removing the veneer pieces that make the center design. The edges of the pattern (about 2” wide) seem to still be firmly attached. I might be able to remove them … haven’t tried yet. 1. The birdseye maple veneer (slightly warped) seems somewhat flexible enough; that is I can gently press it flat on the workbench. So, do I need to put it in a press for a while to flatten it before re-attaching it? What about the pieces of Amaranth that have the same problem of warping? 2. What are your recommendations for glue? I’ll stay away from contact cement; would also like to stay away from white glue because it’s rather wet. Is Titebond recommended? Hide glue? (never used it before); Rockler’s veneer glue; something else? 3. The plywood substrate appears flat. 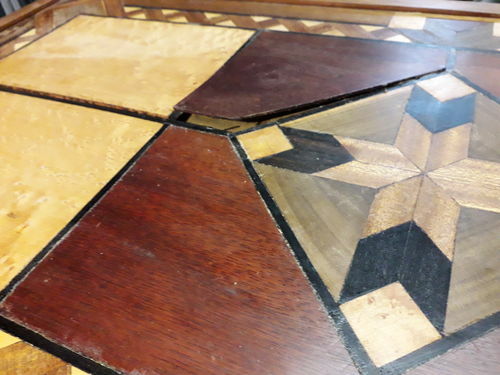 But, when regluing all the veneer pieces to the top, should I also put a thin layer of glue on the underside of the substrate, to seal it, thus to try to equalise any tension that might result when the top is repaired? 4. Note that I don’t have a vacuum bag press, so will have to find a way to clamp the pieces. Should I glue and clamp each piece? Or, tape it all together and then glue it all back down (approximately 2 ft x 4 ft). 4. When all the veneer pieces are back in place, should I use a scraper or else use very fine sandpaper to remove the old finish. I do not know what it is. It does not appear to be discolored, but is uneven. 5. What are your recommendations for a finish? Shellac? Varnish? Wax? Other? How long should I wait (after gluing down the veneer pieces again) before applying a finish? Well, that’s about all the questions I can think of. I appreciate the experience you all have. - If you can assemble the piece on tape first and apply as one piece, that is definitely the way to go. - 1/8” is pretty thick for marquetry so a good sanding won’t hurt it. It will also bring back the original colours. - I like shellac, French polish to be exact, but a padded or even brushed shellac finish will look great and more importantly be reversible. Of course you can PM about this, but if you’re amenable to keeping it in the thread, I’d like to follow along and learn something. still working at cleaning up the various pieces of veneer, almost done with that. A picture would really help. You should be able to attach one by clicking on “img” above the comment box and following the prompts as long as the picture is stored on the device you are using. Failing that PM me and I’ll give you my email address. To PM me click my avatar to go to my profile page and then click “send message” under my avatar there. Welcome to LJ’s. It gets easier. dark lines are ebony, some of which is brittle. I’ve gotten all veneer pieces off now, scraped & sanded off all the adhesive. Will likely need to rough sand ( # 50 ) to enhance adhesion of glue. the border (multi-veneer) is still affixed to the substrate. it doesn’t seem to be coming loose … though I’m wondering whether it would be better to remove it … probably also attached using double stick tape. The picture makes a lot of difference. Is the ebony just the border around the maple or is there a strip between the maple pieces? To keep thinks manageable I think I would try to get the ends done first probably one at a time. This would include the ebony strips and the maple pieces. I would recommend Old Brown Glue and whatever you have for pressure. First choice mechanical press, second vacuum, third clamps and slightly curved cauls. All will work. Once that is secure you can get the amaranth done and finally the smaller pieces. They could go in as a group with tape. Dry fit as much as you can to be sure things will fit and be prepared to make little adjustments if necessary. When all that is back together you could give the other pieces a little pry to see if they come off. They will be easier to place with the centre all done. > ebony border outlines all major pieces. See attached above. I’ll try to attach a top-down photo to this message. Ebony strips are about 1/8 wide. > will have to be mechanical press using clamps and blocks. Would love to use a vac bag, but not sure that I have enough time to apply OBG, then place pieces in sections, then get it all in the bag. Or? > With your earlier suggestion on cauls (hadn’t heard about them before), ... seems that I would need enough cauls side by side to cover the entire top, because of the number of different sized pieces and the layout, eh? > OBG … have done some reading on it. Seems that it needs to applied hot? That could make things interesting. > Would PPR glue be easier to handle? > Ah, OK. makes sense. > very helpful comments. Many thanks. This is evening enjoyment after regular work, so quite likely I would need to do it in steps. Vacuum bags are over rated IMHO except for very large pieces. I have one and have never used it since I built my mechanical press. I have several reasons but they aren’t relevant here. 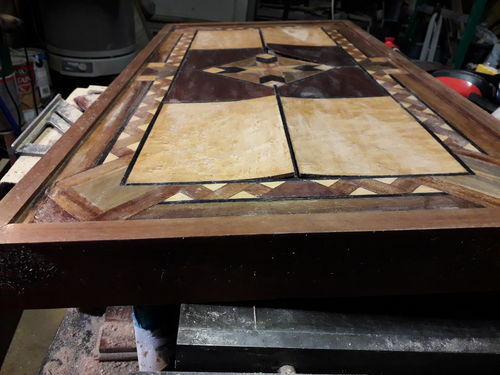 All you need is a piece of 3/4 MDF or plywood (the platen) the size of the area you will be pressing and two or three or more if you like pieces (like 2×4’s) that are slightly curved on the bottom (the cauls) to clamp across the platen. The curve means that when you clamp the ends the centre still gets pressure. The amount of rocker should result in even pressure on the centre and edges. It doesn’t take much. OBG will give you lots of time. It doesn’t need to be hot, just warm. It is hide glue so it is reversible. You want that. Thanks for all the help, Paul. a) since the veneer is about 1/8 thick, should I try to get some glue on the edges of veneer pieces that are contiguous. Perhaps some of this will happen anyway. b) try this project as a whole (all at one time), OR in three parts 1. birdseye maple + ebony strips, 2) amaranth and medallion 3) birdseye maple + filler ebony strips. and a new question: should I score (or lightly sand with # 50 paper) both the substrate and the underside of the veneer to enhance glue adhesion? Both seem rather smooth due to scraping off the old glue.